"A complete studio that allows you to create and edit music"
There are many music editing tools available that offer many features, but these are usually very complicated. We would like to present to you a tool that allows you to edit and create music with great ease. FL Studio (it used to be called 'Fruity Loops') is a complete virtual studio from where you can create great quality music and songs. The program lets you edit, record and mix audio files in a professional way, and it saves all of your work in its own native format, FLP. This studio includes many features and functions that help you to create and edit your music. 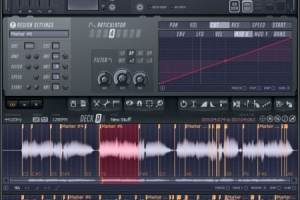 You can use several music files at the same time to create a new mix or a new song. It has many effects that you can use, such as fading, auto expansion and reverberation. The utility also has an unlimited number of instrument channels, each with its own individual volume, panning and pitch controls. FL Studio includes a Bass editor and a complete synthesizer engine called 'TS404'. There is also a built-in piano that is capable of controlling external MIDI devices. FL studio is compatible with many audio devices, thanks to the ASIO and WDM drivers that are included.